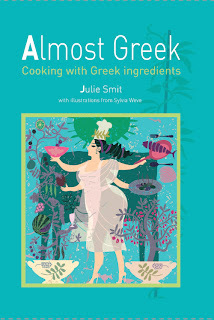 Smitaki: June 28 – Put away that winter feeling: eat Greek food! June 28 – Put away that winter feeling: eat Greek food! Just to make the readers in the rest of Europe jealous: here on Lesvos (and in the rest of Greece) we are fully enjoying the sun, the warmth, the sea and the food. Sometimes I wonder whether life here on the island in the summer, when high temperatures make it difficult to concentrate on work, consists of anything other than swimming and eating. But the warm months not only bring fun. You have to learn to live with spiders, mosquitos and many other flying and creeping insect-like objects: brrrrrr. I just read that this year on the neighbouring islands of Lemnos and Ai Stratis there are many more grasshoppers as usual. I have also seen here on Lesvos many of these jumping fellows not only outside, but also inside my house. Even if you expend lots of effort to get your house insect free, grasshoppers know how to get in and can give you a hard time. I can live with some grasshoppers in the house, so the place was not hermetically sealed. This changed yesterday when a huge wind scorpion or camel spider tried to find his way in my house through the screen door. Now all cracks and screen doors and windows are glued so that no nook or crannie offers the possibility for the miscreants to sneak in. Even just writing about this creature gives me the creeps and I constantly look at the screen door afraid his partner may show up to take revenge. A friend (I was too afraid even to get close) killed this pseudo spider with flea spray (for dogs) and, really, what a creep it was. My friend put the creep in a box, saying that this was a very rare animal. Well, I no longer believe one word of it, because during ten years here on Lesvos I have only once seen one and this was the third camel spider I have seen in two months! You think we have a camel spider plague? 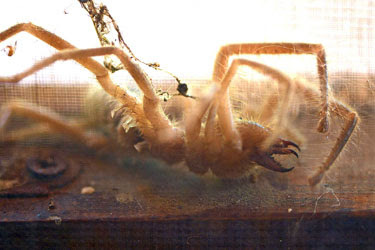 Read about my first encounter with this horror spider in: Creepy! In more than one country it is common to eat grasshoppers. As there are so many around now maybe I should experiment with frying them. And why not, maybe this camel spider is also a delicacy. However, as I can barely look at this horror, I don’t think I will be able to throw him into the cooking pan. And I have to admit that I’m not reading-up on frying grasshoppers. I prefer to grill watermelon. The culinary challenge I have taken up was to make flour from chickpeas. This pulse here is mainly grown around Lisvori (Lesvos). In Greece chickpeas are eaten cooked with or without a spicy tomato sauce. But there are many more possibilities for this legume, like falafel or hummus . . . and plenty of recipes with chickpea flour. I promised a friend who is on a gluten free diet to cook for him and that is how I got the idea because chickpeas suit this diet. Although I nearly gave up trying to make the flour because when I poured chickpeas into my food processor and I pushed the button for grinding, such an incredible hard noise arose that I was afraid the food processor would explode. So this is a warning for anybody grinding chickpeas: put on earmuffs for the first minutes! Grinding dried chick peas will produce a fine flour you can use to make spinach-egg-omelettes or pancakes. I was inspired by the Italian panella, Sicilian fried cookies spiced with parsley. I followed the recipe for the batter but used Greek spices: a recipe that would suit my cooking book Almost Greek. Because of the wet winter the summer vegetables are only now being displayed in large numbers in the shops: courgettes, aubergines, cucumbers and tomatoes. They are not my favourites but I think it a challenge to find as many recipes for them as possible — like an eggplant curry or a salad of half-dried tomatoes. 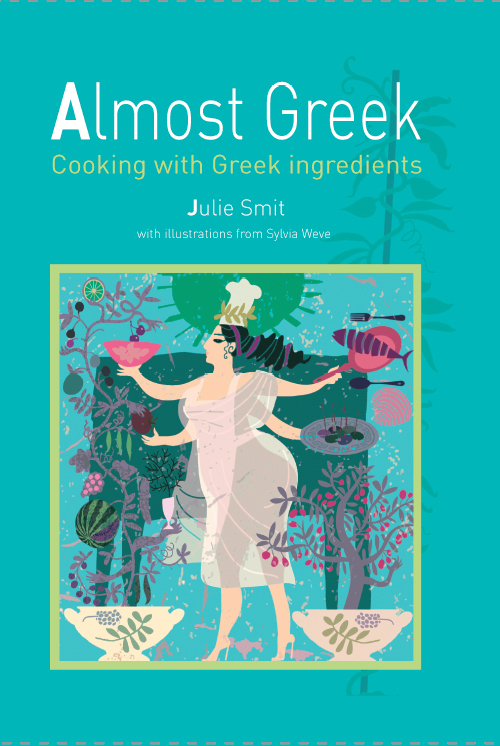 Will this be a first step to a second cookbook, a companion to Almost Greek? I am not sure. But the good news is that the illustrator Sylvia Weve won a highly regarded price in Holland (De Zilveren Penseel) for her drawings in a Dutch children’s book Aan de kant, ik ben je oma niet! (writer: Bette Westera). Grind about 250 gr chick peas into a flour: just grind for a few minutes, sieve out the fine flour and repeat the process with the remaining pieces of chickpeas (the pieces will get smaller and smaller and the noise lesser). Continue until you obtain about 200 gr fine flour. Put the flour in a pan on a low heat and slowly pour the water in, stir until you get a thick smooth mass. Add the spices, lemon juice and salt & pepper according to your taste. Spread the batter onto baking paper (to a thickness of about 2 cm). Put away to cool and thicken (2 – 3 hours). Cut the thickened batter in small cubes (5 by 2 cm or what ever form you fancy) and fry them in the oil until they are golden. Good as mezès or as a side dish for a Mediterranean dinner.